Since switching to a low carb diet, there is one thing that always tempts my husband and I.
We’ve had a decent time of making filling meals to crush cravings for carbs – but there is one giant, gaping hole of a meal missing. There is nothing more delicious, comforting, or relaxing than pizza – it is a quick go-to when you’re busy, it’s a great indulgent treat for get-togethers, and it’s as easy ar picking up a phone to order it in. While we’ve missed the buttery crunch of pizza dough – we have come up with some delicious pizza alternatives – and the one I’m sharing today is my absolute favorite! 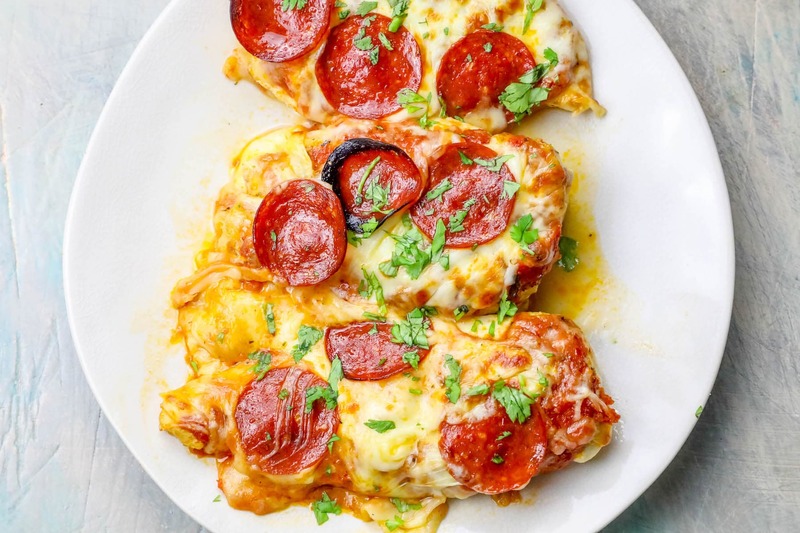 Just Take Me To The Low Carb Keto Cheesy Pizza Chicken Recipe Already! 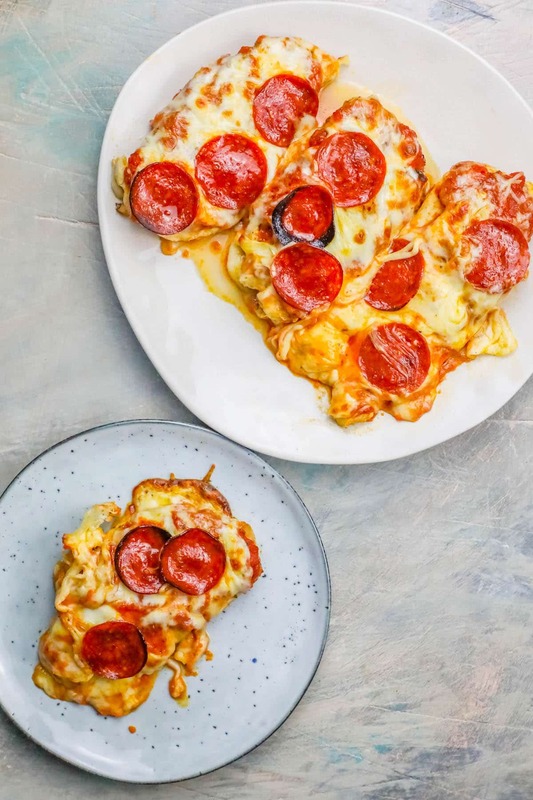 If you’d rather skip my (very helpful, i think) tips and tricks, essential cooking info, and similar recipe ideas – and get straight to this deliciously easy Low Carb Keto Cheesy Pizza Chicken Recipe – simply scroll to the bottom of the page where you can find the printable recipe card. My husband and I have recently started using thinly sliced (and pounded) chicken as a pizza “crust” – that is delicious and full of family friendly flavor. 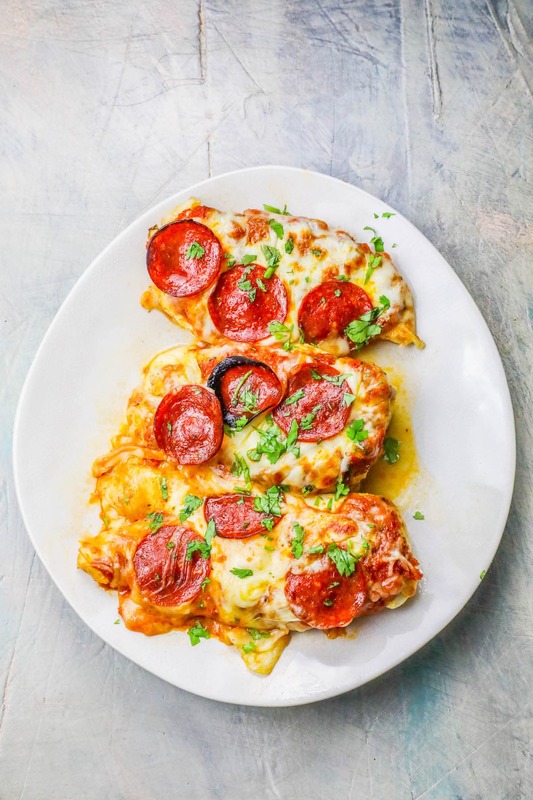 This ooey, gooey, rich and delicious low carb cheesy pizza chicken is bursting with protein, cheese, and tons of pizza flavor – and it is so incredibly easy to make. 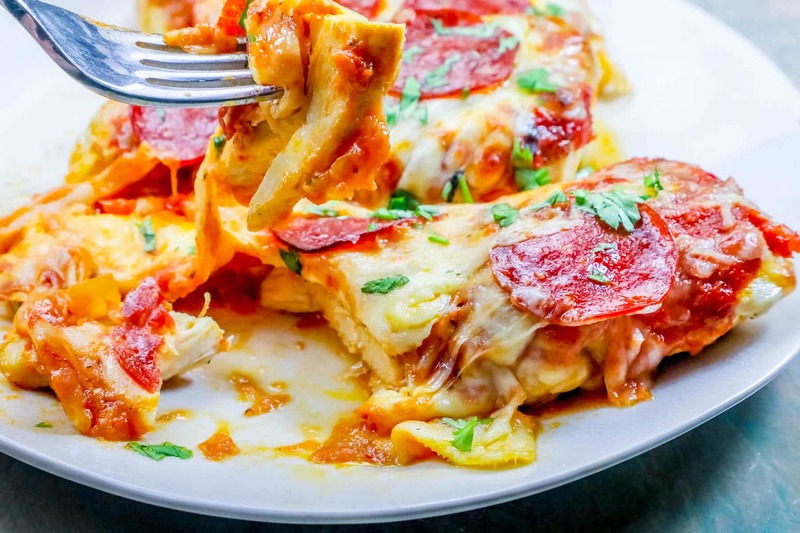 It feeds a crowd, just like pizza, and can be pre-prepped for Friday night celebrations or a big dinner party – making it the ideal low carb cozy comfort food! 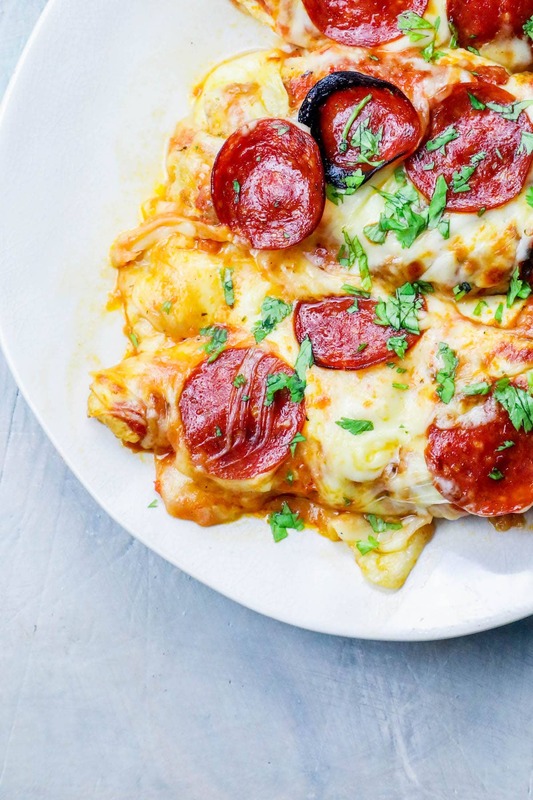 Using chicken as a base for a gooey cheesy pizza might seem a bit funny – but it works perfectly and is insanely easy! The thinner your chicken, the more it will crisp up and take on a nice light but sturdy texture that is perfect as the base for a cheesy pizza! -Brown chicken but don’t fully cook. Since you’ll be cooking chicken as a “pizza”, you can brown chicken well but you don’t need to worry about cooking all the way to 165 internal temperature right away – it will cook the rest of the way when baking. -Bake chicken until cheese is bubbly and crunchy. This baked chicken is perfect and full of pizza flavor – but you want it to have nicely crisped cheese. Make sure to keep baking it until it browns! 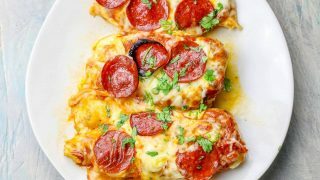 If you love this cheesy pizza chicken recipe, you’ll love these other low carb comfort food recipe ideas! Be sure to click the link or the picture of each recipe for the printable instructions – or click to watch me make each recipe below! 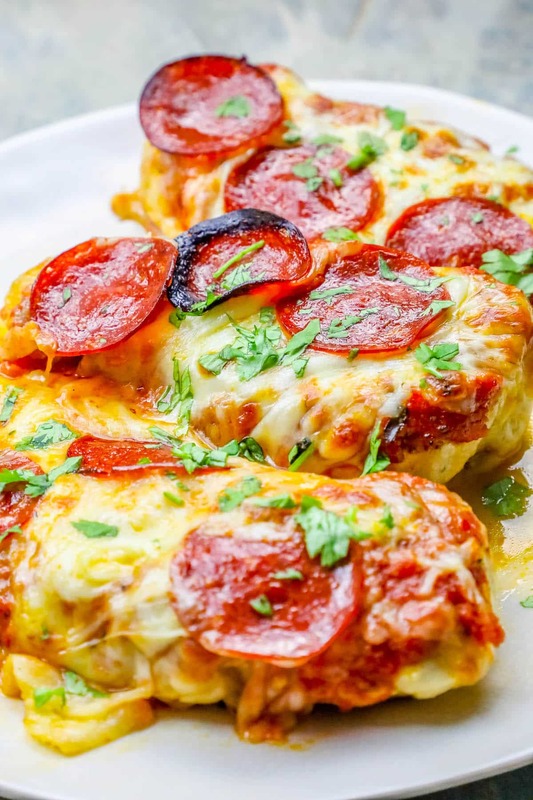 If you love this Easy Low Carb Keto Cheesy Pizza Chicken Recipe as much as I do, please write a five star review, and be sure to help me share on facebook and pinterest! If you love this easy cheesy chicken pizza recipe, please watch me make it below! Butterfly chicken breasts and cut into two. Season each breast with salt and herbs. Add olive oil to a heavy pan, let heat until shimmery. Add chicken to pan in batches, brown each side well, about 4 minutes. Chicken will not be to 165 degrees internal temp - that is ok.
Add chicken to baking sheet, and top with sauce, more herbs, and cheese. Bake for 25-30 minutes, until cheese is bubbly and melted, and chicken has reached internal temp of 165 degrees. Oh I love this recipe! You can never go wrong with a low carb pizza recipe, I’m excited to give this a try. Thank you! I made this and it was delicious. Thanks for sharing.